I’m re-reading Victor Hugo’s Les Misérables after 20 years. Start with part 1, go back to read about Paris’ chief scumbags, or read on. All the surviving major players in the events outside the barricade meet in this scene: Marius meets Éponine, Thénardier encounters Valjean and Cosette (and tries to rob them), and even Javert returns…ironically to rescue the man he’s hunted! This is a long one, mainly because there isn’t a good spot to break it up. I suppose I could split it between the initial meetings and the extortion attempt, but really, this whole sequence flows together more smoothly than anything else of comparable length so far. I found myself reluctant to put the book down while reading it. Now, there’s a cheerful title: “The noxious poor.” As the section goes on, it becomes clear that the title distinguishes the Thénardiers from the honest poor, like Marius or Fantine. The “first tenant” at the Gorbeau tenement complains about how everything costs more these days. Marius, still in despair months after he’s last seen the girl of his dreams, finally meets Éponine on Groundhog Day, when she knocks on his door begging for money. Éponine is thrilled to find books in Marius’ room. She clearly has a crush on him already, and rambles to him about how she likes to go off on her own. There aren’t any exact matches to the imagery, but I’m certain this passage inspired the song. Thénardier now looks like “a combination of vulture and prosecuting attorney.” He’s running a series of scams begging for money through letters. He diversifies his identities, tactics and targets in the pitches. Today he’d claim to be a Nigerian prince in one letter and a lottery commissioner in another. But the letter begging his neighbor for money is about as honest as it could be…except for his name, which he’s given as Jondrette. …who of course turns out to be Valjean, who has brought Cosette, while Marius is spying. Suddenly he’s lost interest in his neighbors. At this point we’re still close enough to Marius’ point of view that we don’t know anyone’s real names (though most readers will have figured it out by now). Valjean is still Monsieur Leblanc, Thénardier is still Jondrette, and he still thinks Cosette’s name is Ursula. 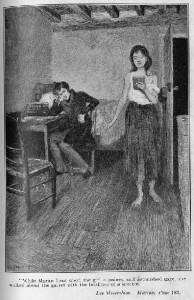 After the initial exchange, Éponine sees that Marius is unhappy and offers to help him out. She mentions that she’s good at finding people. He asks if she can find the old man. You mean the girl, don’t you. Um, yeah. *grumble* She’s not happy about it, but “What’ll you give me?” “Anything!” is enough to secure her help. Thénardier recognized Valjean immediately. When he tells his wife his suspicions about the girl, she’s outraged that her daughters are living in such poor conditions while she lives like a lady. Of course Thénardier has plans for the old man. Always an opportunist. He’s arranged for Valjean to return that evening, and plans to hire Patron-Minette to help trap him for extortion. Marius “might pity a toad, but he would set his foot on a viper.” Unable to think of anything else he can do, he goes to report the trap to the police. Guess who is on duty at the station? That’s right, it’s Javert! There are an awful lot of coincidences: Marius living next to the man he’s been searching for, Valjean and Cosette answering the plea for help from the neighbors of Cosette’s secret crush, those neighbors turning out to be the family that once held custody of and abused Cosette, them showing up while Marius is spying, and now, Marius reporting the planned crime to the one man who has been searching for Jean Valjean for over a decade. And he’s not even supposed to be there that day! “You talk like a brave man and an honest one. Courage does not fear crime, and honesty has no need to fear authority.” If only it were that simple. Javert decides to set up a sting, with Marius as lookout: He’s to spy on the ambush, then signal the police so they can catch the gang in the act. The signal? A pistol shot. Into the ceiling, or anywhere, because the place is so decrepit it doesn’t matter if it gets shot up. And Javert hands him two pistols. Imagine that today: Some random citizen who lives in the slums walks into the police station, reports that his neighbor is planning to kidnap someone for extortion tonight, and the police hand him a pair of loaded guns, ask him to help with the sting, and send him home. “If ambushes had never existed, it was here that they might have been invented.” Another of Hugo’s wonderful descriptions of this tenement and its neighborhood. 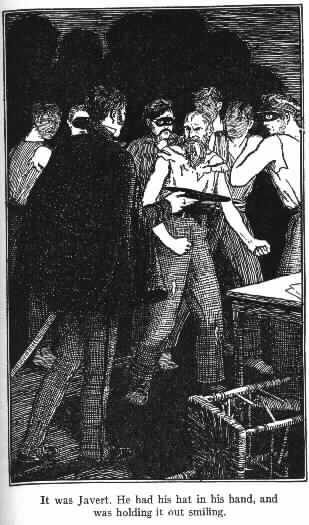 Valjean sends them on a wild goose chase so that he’ll have time to cut his bonds with a tool concealed in a coin…and he grabs the hot chisel. He then burns himself to show how impervious he is to pain and throws it out the window. Holy crap, he IS Wolverine! “Perhaps you would like to borrow my hat,” said a voice from the doorway. They swung around and saw that it was Javert. He stood there holding out his hat with a smile. Actually, he’s a total badass in this whole scene. It goes a long way toward making Javert appealing. He’s wrong about Valjean and Fantine, and he’s opposed to our POV characters for the revolt, and yeah, he’s a total jerk — but when he’s in his element, he’s damn good at his job, and Paris is probably better off for having him there. Pages covered: 627-701. 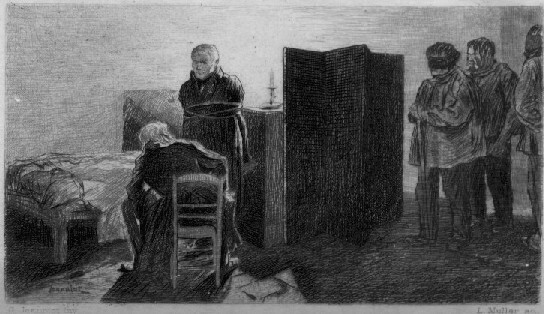 Images by Jeanniot and A. Gladys Peck from unidentified editions of Les Misérables, via the Pont-au-Change illustration gallery. This entry was posted in Book Commentary and tagged Aliases, Azelma, Coincidence, Cosette, Dilemma, Eponine, Gorbeau Tenement, Javert, Jean Valjean, Jondrette, Leblanc and Lanoire, Marius, Parenting, Paris, Patron-Minette, Poverty, Robbery, Thenardiers on June 22, 2013 by Kelson Vibber.